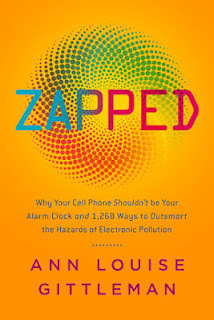 Zapped - Why Your Cell Phone Shouldn't Be Your Alarm Clock and 1,268 Ways to Outsmart the Hazards of Electronic Pollution by Ann Louise Gittleman is an informative read about the prevalence and damage that electromagnetic fields (EMF) and electronic pollution and how to mitigate these in the home and at work. However Zapped goes even further to suggest that today's lifestyle is full of electronic devices such as wi-fi, laptops, ipads, cordless phones, ipods, televisions and time-saving kitchen appliances. Put simply, we are bombarded by EMF every day. Every room in our house has multiple devices plugged into powerpoints and some cases powerboards. At the time of writing this post, I have twelve other wi-fi networks criss-crossing mine at home making thirteen in total. Wow! Some of us are sensitive to EMF and Gittleman believes that many health related problems that have been attributed to stress or other conditions can be attributed to EMF, even going so far as to suggest conditions such as chronic fatigue syndrome, headaches, migraines and more. Her evidence and information is quite compelling and certainly makes for interesting reading. Zapped contains many resources including websites, and suggestions for further reading and I was pleased to see reference to Earthing - The Most Important Health Discovery Ever? by Clinton Ober which is one way to reduce EMF exposure. I've read this book, purchased and use the products daily. Zapped is a great reference book with measurements, advice and guidance for those wanting to learn more about the environment around them. Did you know you can buy house paint to reduce your own exposure to mobile phone towers? 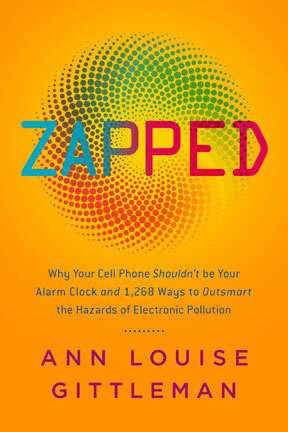 Zapped - Why Your Cell Phone Shouldn't Be Your Alarm Clock and 1,268 Ways to Outsmart the Hazards of Electronic Pollution.